We’ve all been guilty of certain bad money habits over the course of our lives. Heck, you might even be guilty of a bad money habit right now. My worst money habit was using credit cards, and student loans for that matter, to finance a life I wanted but couldn’t afford. Over the course of a few years, I racked up nearly $50,000 in debt. As the saying goes with weight loss, it took me much longer to pay it off than it did to put it on. 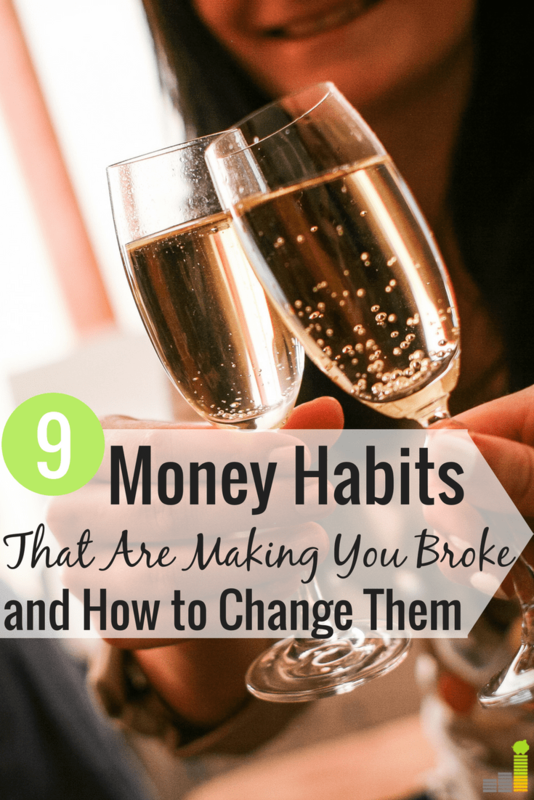 I firmly believe it’s important to identify bad money habits as they do one thing – keep you broke. They keep you from doing the things in life you really want like travel, saving for college and so much more. With that in mind, here are nine bad money habits that are making you broke and what you can do to right the ship. Raise your hand if you get to the end of the month, and you don’t know where your money went. You got each paycheck, but you spent it all on stuff – stuff that has little to no value and will do nothing for your future self. This, by definition, is living paycheck-to-paycheck and, worse yet, it can lead to mountains of debt. This doesn’t mean you can’t enjoy life; quite the opposite in fact. I’d ask one question, though – are you really enjoying going through life being broke? Speaking personally, I hated being broke and the sad thing was that I brought it on myself. I had to find ways to break the paycheck-to-paycheck cycle and choose to stop buying stuff. You may need to take baby steps to stop this cycle. That’s okay; the point is to start. Having money in your bank account at the end of the month can become rather addicting, and that’s a good thing. Living paycheck-to-paycheck is one result of not knowing where your money is going. Think of it this way, if you simply spend to spend, you’re in the dark with your money, which leaves you that much more likely to spend everything you make (or more if you spend on credit cards) – thus making you broke. These are all myths. I’ve written a guide on how to make a budget that walks you through step-by-step on how to make and live by a budget. The trick to doing it right is tracking your spending. That information gives you the power to make decisions that help you and your future self. You can track your spending in many ways from writing it down on a piece of paper to an Excel spreadsheet. I use Personal Capital as it’s free and has so many tools to help you manage your money. If you want to learn more about Personal Capital, here’s my Personal Capital review. Are you current on your monthly bills? If not, this is one of the worst money habits to be practicing. Here’s an example of what I would do before attacking my debt. I’d be at least a month behind on all my bills, aside from rent (most of the time). I’d let the bill get close to being two months behind then I’d make a payment for one month of service. The result? I was constantly one month behind on most of my bills. I thought I was making things easier on myself, but in reality, I was constantly running a rat wheel content with the fact that I was behind. As with the other bad money habits listed, this is no way to live. My Dad used to have saying, “If someone doesn’t like what you look like, they can turn their head.” It’s a simple statement, but our problem is we care too much about what others think of us. That can play itself out in a number of ways, but regarding bad money habits it means one thing – buying status. That may mean overspending on things like cars, houses, clothes or many other things for that matter. It’s not bad to have any of those things, of course, and it’s not wrong to have something nice. However, it is wrong when you overspend for the sake of overspending to gain some sort of status. At the end of the day, it’s you and not the Joneses who have to pay your bills. If they’re not paying your bills, then why exert yourself to buy things you can’t afford to look like them? It doesn’t make sense. Are you currently in debt? Do you know how much debt you have? If not, this is a bad money habit you need to break right now. Paying off debt can be overwhelming, to say the least. It can take years. It requires sacrifice. It can feel suffocating. I experienced all of those things, but I can tell you one thing – they were all worth it to get a debt free life. There are many ways to start paying off debt, so pick a few and start attacking your debt now. Your future self will thank you, trust me. Isn’t shopping to shop a bad money habit? That’s not the kind of shopping around I’m talking about here. I’m talking about finding ways to save money every month so you can save or invest that extra money. You can start with something as simple as looking for a cheaper cell phone plan or negotiating one of your bills to a lower price. The effort required is well worth it if you can knock down some of your monthly obligations. One overlooked area when it comes to shopping around is lowering the interest rate on your debt. This could mean refinancing your student loans or consolidating your credit card debt to a lower interest rate. If you have credit card debt or other high-interest rate debt, you can consolidate it through lenders like Avant or Lending Club and slash your rates by half, or more – allowing you to pay the debt off quicker. If you have student loan debt, you can do the same thing by consolidating with SoFi to lower your rate. What does sleeping in have to do with bad money habits? Hear me out for a minute. How often do you hear yourself saying something like this, “I just never seem to have enough time in the day.”? Ok, now how often do you hit the snooze button multiple times, delaying your start to the day? I know this is something I’ve been guilty of and it results in having less time in the day to get things done. That can be something as simple as working on a project that will make us money, taking a course to pick up a marketable skill to as non-financial as extra time to work out, which gives me more energy, thus allowing me to be more productive throughout the day. The point is you may want to look at things outside of strict financial decisions to break bad money habits. Be honest…do you ever just go to the store or mall because you’re bored? We’ve all been guilty of this at some point in our lives, and impulse shopping can take a bite out of your finances if left unchecked. There are many ways to gain control over impulse shopping, from simply not going to the store to making a list when you do go shopping to only using cash. Find one that works for you and you’ll be surprised at how much less you buy on impulse. There are many other bad money habits we could cover, but the way to attack many of them is through education and taking action. Educating yourself may seem overwhelming, but there’s a wealth of information available through many sources. Find something you want to improve and starting learning how to change your actions. Secondly, is taking action. Again, this may be overwhelming, but it doesn’t have to be that way. One way I’ve found to take action and be successful is to pick one thing and work on it. In a short time, you’ll see you have $100 saved and then $200 and even more to the point that it builds confidence you can do something. Saving may not be the thing you want or need to work on; that’s not the point. The point is to take one action you want to change, start with some baby steps and use that confidence to attack other areas you want to change. In a short time, you’ll notice you’re not broke but growing your net worth. What are some other bad money habits you’ve seen in yourself or others? What keeps you from making changes with your finances? How many times did you hit the snooze button today? I am with you on sleeping in! I’m usually pretty good, but sleeping in even 15 minutes late throws off my whole day. I become disorganized and flustered and my attitude isn’t great. With money, you have to be organized, otherwise you lose control so I think waking up a little earlier can really help to start the day. My mother always takes 15 minutes in the morning to organize her finances and I’m trying to implement this as well! I’ve started to get up two hours earlier than before. I would hit the snooze button multiple times, rush around like crazy and grab a starbucks latte on the way to the office. Getting up earlier allows me to relax, catch up on some reading (like this article), and enjoy a home crafted latte. My mornings are so different now and I love them! Plus it’s saving me a ton of money. That’s awesome Jackie! I find the same exact thing, if I get up when I plan then I can take my time on things as I’d like which provides multiple benefits. I will definitely admit to sleeping in on Saturdays but the rest of the days of the week I’m on top of it! For keeping track of expenses and a budget, I’m starting to like Personal Capital less and less the more I look into other options. There’s just so many other better options out there that break things down into more detail (or give you the freedom to format the data how you want it). Yep, Saturday is the one day we don’t set the alarm clock and can usually get to sleep until 9 or so, so long as the kids are quiet. 🙂 Interesting, I’ve not ventured far out from PC, but it works for us. I used to be guilty of all the bad money habits you mentioned, except paying the bills late. That only happened a couple of times, and eventually they were paid only few days later than the due date, and still I felt so guilty! 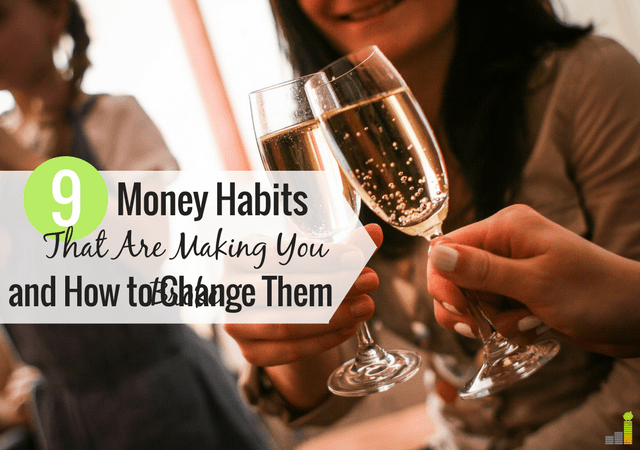 But the other money habits – yep, been there, done that. But on the bright side, learning from your own mistakes is the best way to kick a bad habit. Completely agreed Adriana. Making some of these mistakes were really painful, but the lessons that came about as a result are priceless. Finally retired last year, both my husband + I, without a pension plan, only our s/securities, investments, and 401Ks. Believe me, if you are young enough, pay off all debts and save for your retirement. We were both 65-1/2 when we retired + everyone should have a plan to finally enjoy their home, their community, + people that they enjoy, instead of being all-consumed by a career. Godspeed on everyone’s frugality + great ideas offered here in this article ! If a stranger was to offer you the cash amount of an item you are about to buy, would you take the cash instead? If you answered yes! Then you obviously don’t need to buy that item!